Welcome to Denver where 300 days of sunshine, a thriving cultural scene, diverse neighborhoods, and natural beauty combine for the world's most spectactular playground. 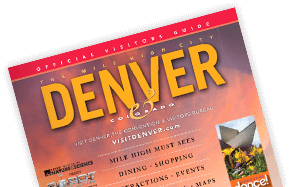 A young, active city at the base of the Colorado Rocky Mountains, Denver's stunning architecture, award-winning dining and unparalleled views are all within the walking distance from the 16th Street pedestrian mall. Upscale shopping awaits in Cherry Creek, while Denver's seven professional sports teams entertain year-round.